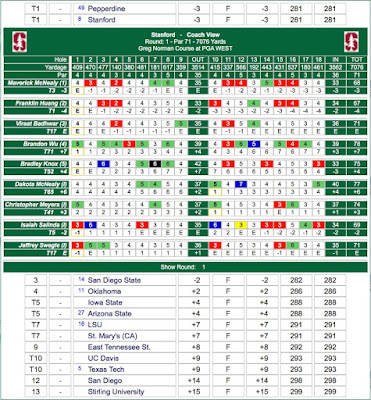 Stanford struggled in round 3 to a 7 over par 291 total to finish tied for 4th, 9 strokes behind the winning LSU Tigers. Despite the struggles overall, two players stood out with solid performances, Franklin Huang (67-69-74 210) and Isaiah Salinda (69-71-70 210), with Isaiah playing as an individual, who tied for 6th overall with 3-under par 210 totals. 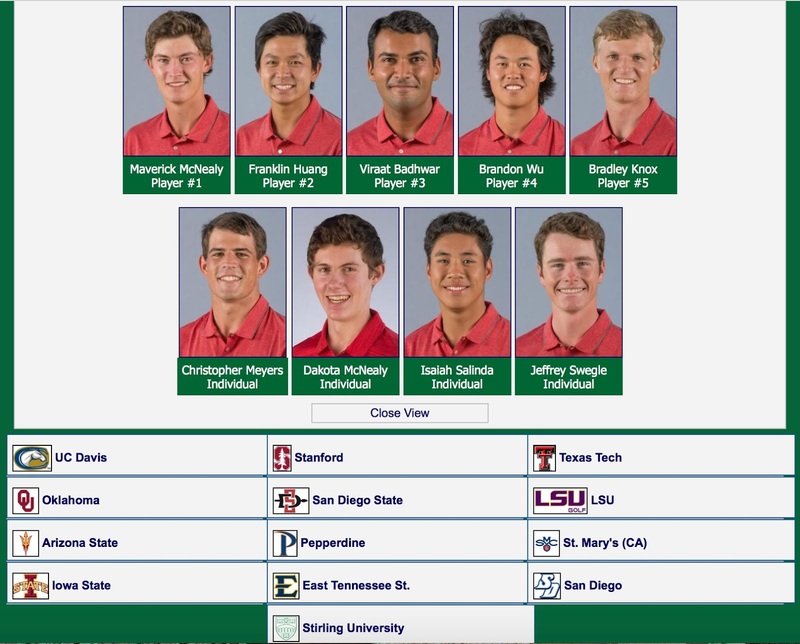 Maverick McNealy (68-74-72 214) ended tied for 18th, Viraat Badhwar (71-74-74 219) tied for 30th, Brandon Wu (78-72-71 221) tied for 39th and Bradley Knox (75-75-77 227) tied for 61st. 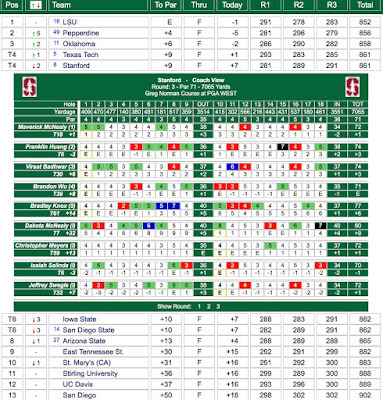 Other individual scores for Stanford included Jeff Swegle (71-77-72 220) tying for 32nd, Chris Meyers (74-80-72 226) tying for 59th and Dakota McNealy (77-88-80 245) finishing 77th. 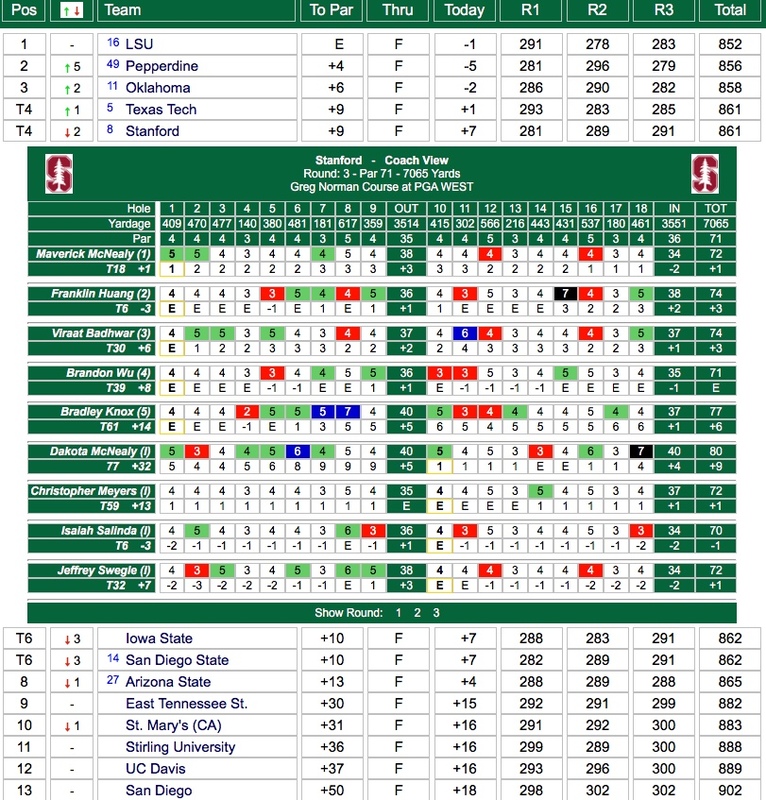 After a 5-over par 289 team total in round 2, Stanford sits in 2nd place, one stroke behind leading LSU. Franklin Huang again led the way with a fine 69 and is in 2nd place overall, 2 strokes out of the lead with his 67-69 136 total. Maverick McNealy's 74 left him tied for 15th with his 68-74 142, Viraat Badhwar's 74 (71-74 275) leaves him tied for 27th while Bradley Knox (75-75 150) and Brandon Wu (78-72 150) are tied for 53rd. 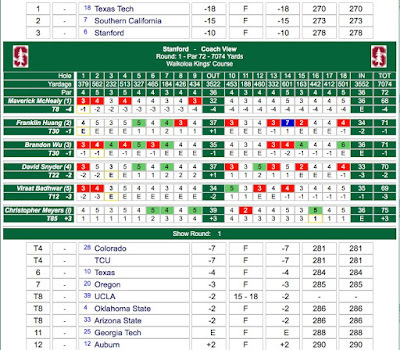 Stanford's four individuals were led by a very strong showing by Isiah Salinda who is tied for 6th on rounds of 69-71 140. Jeff Swegle is tied for 39th after rounds of 71-77 148, Chris Meyers is tied for 70th with 74-80 154 and Dakota McNealy is 78th with 77-88 165. 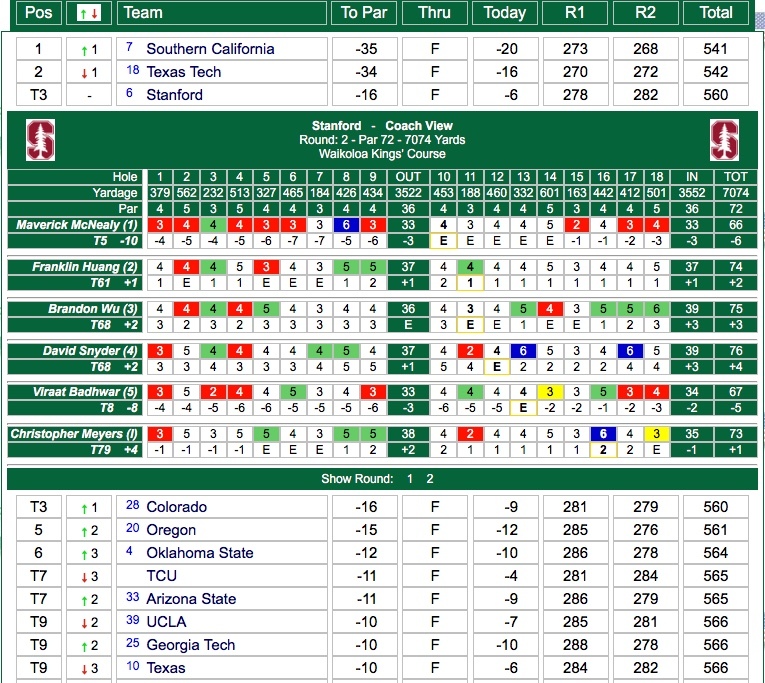 Stanford finished tied for 1st with Pepperdine in round 1 after a 3-under team total of 281. Franklin Huang was 4-under at 67 to tie for 1st, Maverick McNealy shot 68 and tied for 3rd, Viraat Badhwar's 71 puts him tied for 17th, Bradley Knox with 75 tied for 52nd and Brandon Wu's 78 leaves him tied for 71st. Playing as individuals, Isaiah Salinda shot 69 to tie for 3rd, Jeff Swegle had a 71 to tie for 17th, Chris Meyers shot 74 to tie for 41st and Dakota McNealy shot 77 to tie for 65th in his first collegiate round. Stanford sends 9 players into The Prestige at PGA West including Maverick McNealy, Franklin Huang, Viraat Badhwar, Brandon Wu and Bradley Knox plus the following individuals: Chris Meyers, Dakota McNealy, Isaiah Salinda and Jeff Swegle. • Stanford and UC Davis will co-host The Prestige at PGA West, as the 17th edition of the event will take place Feb. 20-22. • The Cardinal has won the event twice (2006 and 2014). Maverick McNealy (2015), Patrick Rodgers (2014), Andrew Yun (2010), Zach Miller (2006) and James Lee (2000) each brought home medalist honors. • The Greg Norman Course at PGA West is the fifth site at which the tournament has been contested, following in the path of Desert Willow Golf Course, La Quinta Resort Mountain Course, TPC Stadium Course and Jack Nicklaus Tournament Course (PGA West). • Eighth-ranked Stanford will be joined by No. 5 Texas Tech, No. 11 Oklahoma, No. 14 San Diego State, No. 16 LSU, Arizona State, East Tennessee State, Iowa State, Pepperdine, St. Mary’s, San Diego, UC Davis and Scotland's University of Stirling. A strong field of 21 teams is competing in this year's American Ari Invitational, hosted by Hawaii-Hilo University. The field includes 7 Pac-12 teams and several national powers such as Oklahoma State and Texas. 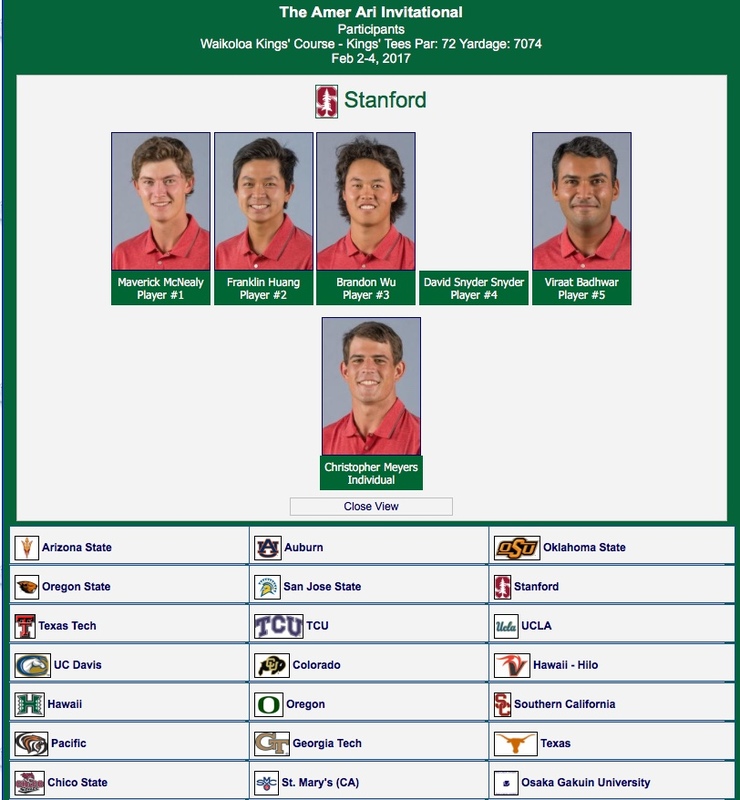 Stanford's six players include #1 ranked amateur and senior Maverick McNealy, junior Franklin Huang, sophomore Brandon Wu, freshman David Snyder, senior Viraat Badhwar plus sophomore Chris Meyers playing as an individual. This will be David Snyder's (see photo at right) first collegiate tournament. David is from Texas. The weather forecast is favorable with sunny skies, temperatures in the low eighties and light to variable winds topping out at 15 mpg, so scoring should go low. 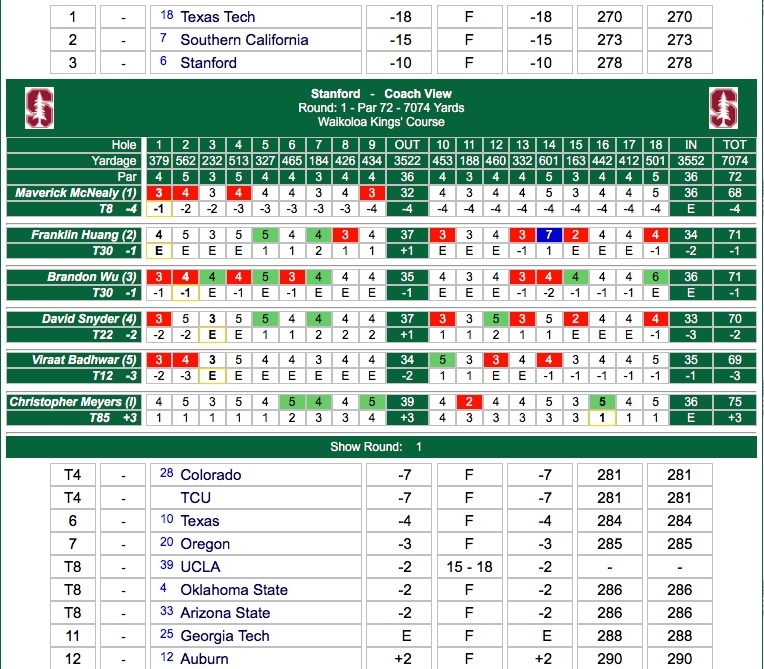 Stanford finished in 6th place with an 21 under par 843 team total, 23 strokes behind the winning Texas Tech team. 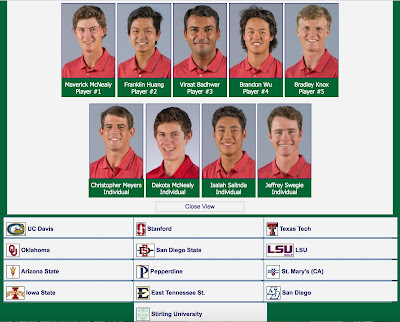 The Cardinal was led by its two seniors as Maverick McNealy (68-66-68 202) finished 4th with his excellent 14 under par 202 total while Viraat Badhwar (69-67-70 206) finished T7 with his 10 under par 206 total. Maverick finished 2 strokes back of a trio of winners. Brandon Wu (71-74-71 216) finished tied for 56th, Franklin Huang (71-74-74 219) was tied for 66th and David Snyder (70-76-75 221), playing in his first collegiate event, finished tied for 75th. Chris Meyers (75-73-80 228), playing as an individual, finished tied for 107th. Next up February 2-4 will be The Prestige played in La Quinta in an event co-hosted by Stanford. 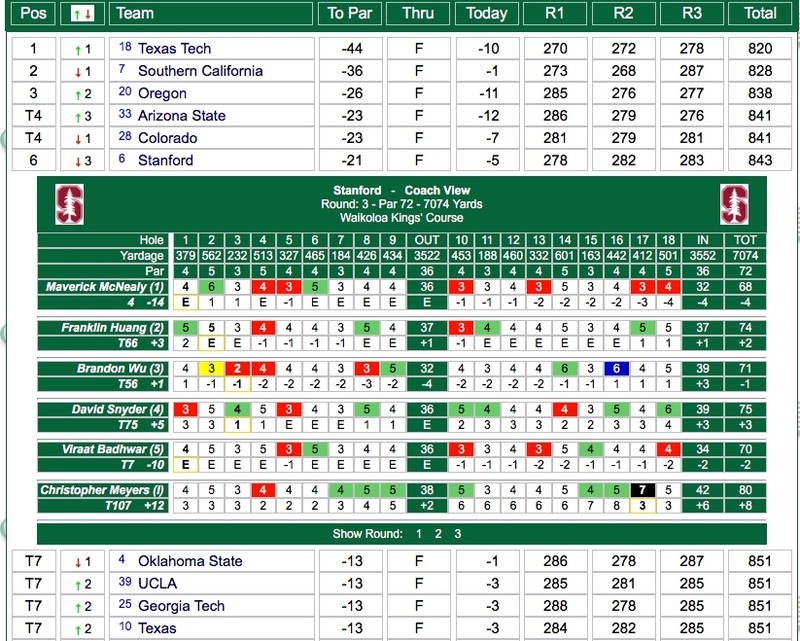 Top ten team results and Stanford's final round scorecards are shown below. 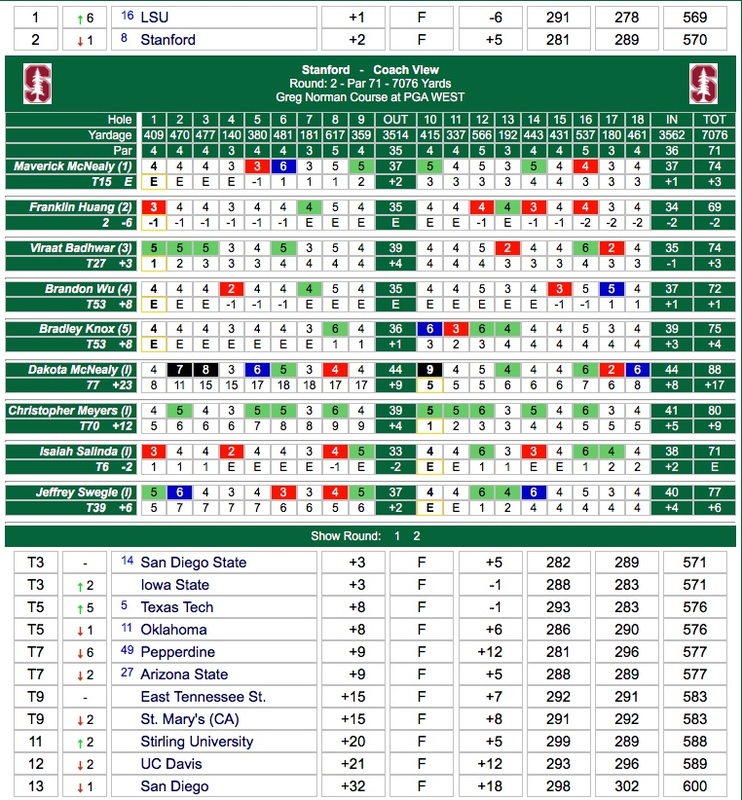 Despite strong rounds from Maverick McNealy and Viraat Badhwar, Stanford fell 19 shots behind leading USC after a 6-under 282 second round. McNealy's second round 66 (68-66 134 T5) included 9 birdies leaving him 4 shots behind the individual leader while Badhwar's 67 (69-67 136 T8) included 6 birdies and an eagle on the 601 yard 14th. Franklin Huang (71-74 145 T61), David Snyder (70-76 146 T68) and Brandon Wu (71-75 146 T68) all struggled in round 2 while Chris Meyers (75-73 148 T79) improved with his round that included an eagle on 18. 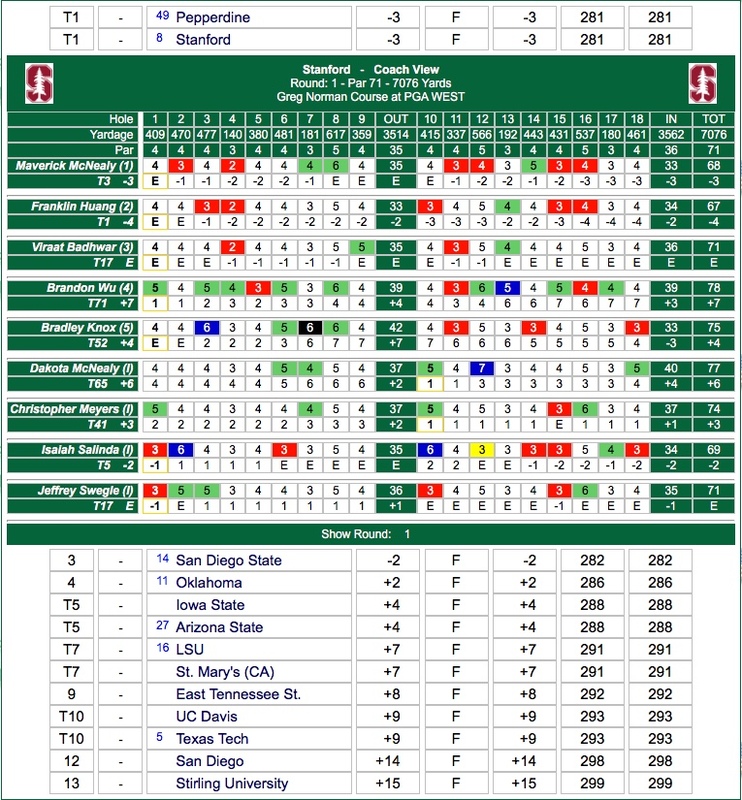 Top team results and individual Stanford scorecards for round two are included below - click to enlarge. 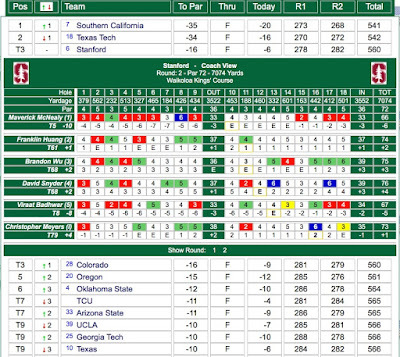 Stanford finished in 3rd place after a 10-under par 278 total for round one, 8 shots behind leading Texas Tech. 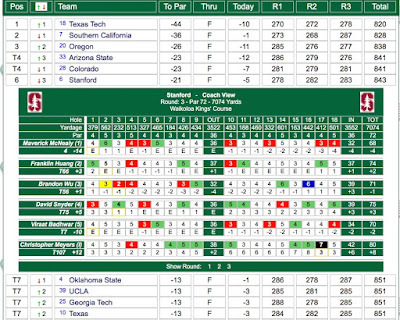 The Cardinal was led by Maverick McNealy's 4-under 68 (4 behind the individual leaders) followed by freshman David Snyder's 69, Viraat Badhwar's 70 and 71s by Franklin Huang and Brandon Wu. Playing as an individual, Chris Meyers had an opening 75. 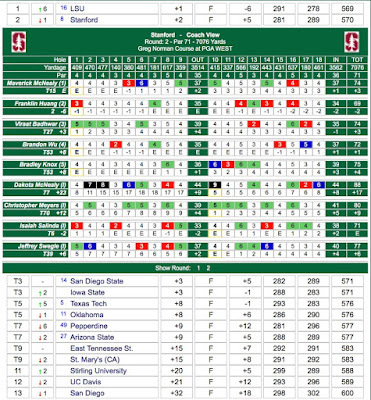 Team and Stanford scoring is shown below - click to enlarge.